The resolution of our videos plays a great role nowadays in the overall experience of watching and sharing a video. But what happens when the video resolution is poor? Or the video is too dark or shaky too much? Or there is some background audio noise recorded in the video? How to improve the video quality in such cases? It's simple - we use the video quality enhancers that are out there. In this article, we are listing the 4 best video quality enhancers [free and paid] which you can download and use for free - on both Mac and Windows. There are so many video enhancement software on the market, while in this article, we have picked up top 10 best video quality enhancers [free and paid] on Windows and Mac which are powerful enough to enhance your clips. Wondershare Filmora9 is definitely the world's finest video editor on the market and deserved the #1 place on our list. Filmora9 is available on Windows and Mac both, and the screenshots below is from Windows version. Beside, the exported video on Windows also can be used on Mac. In Filmora9 video editor, you will find some professional tools that help you improve the video quality and more than 300 creative filters and effects to make your video with a new fresh look to improve video qualith without much effort. Aside from the features that let you change video rotation easily, this program is one of the most reliable currently on the marketplace. Open the program and hit the button 'Import' to load the local files to media library. You can also just drag-and-drop your files into the program. Whether it's a video, audio or a picture - Wondershare Filmora9 is able to enhance its quality. To improve the video quality by removing the shakiness in the video clip, just right-click the video clip in the timeline and select Stabilization. 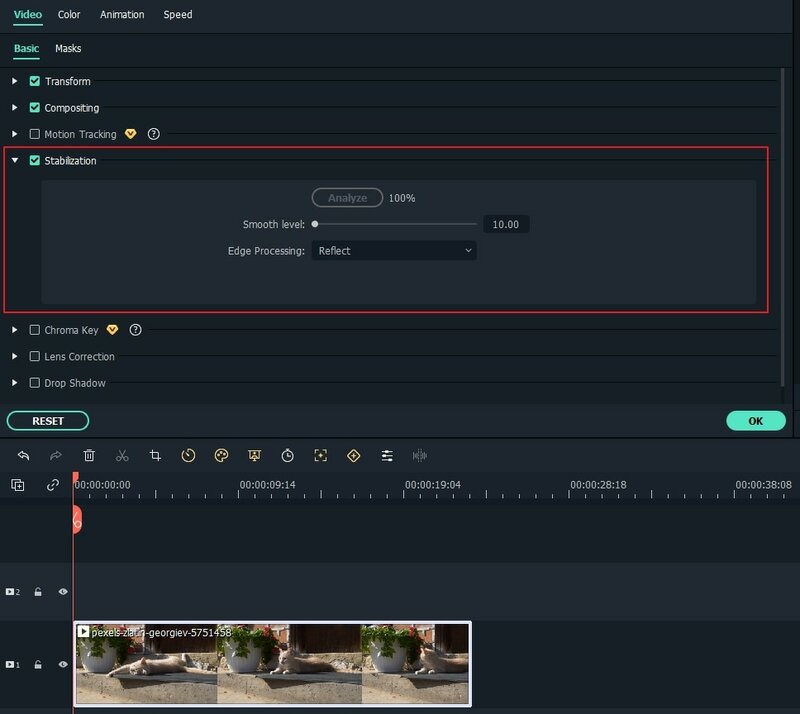 A video editing panel will open at the top left corner, and Filmora9 will analyze it automatically. You can also adjust the Smooth Level to get the best result. For more detailed information about video stabilization, you can check our Stabilize Video guide. After uploading your media file to the program, drag and drop it to the timeline. Double click the media file in timeline to open the video editing panel. Click Color tab. Here you can adjust white balance, tone and 3D LUT. And for audio, click Audio and then you can adjust output volume, fade in, fade out and pitch. To enhance the color in video, you can easily change the color contrast, saturation, brightness tint quickly. 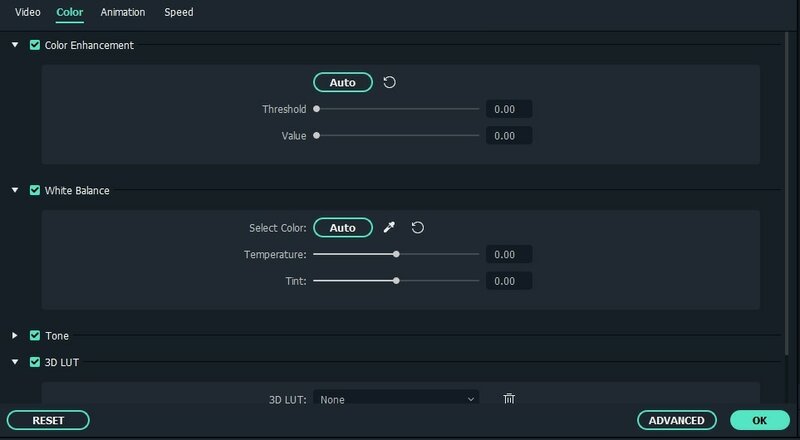 You can also click the Advanced button to apply more color adjustment, such as white balance, Light including highlights, shadows, whites and black, HSL parameters and Vignette effects, and apply 3D LUT. To imporve the Audio quality in Video, you can remove the background noise in the video. Switch to Audio tab, and then click Remove background noise . Filmora9 also features a Audio Mixer and Audio Equalizer (EQ) for you to improve the audio sound. For more audio editing features, you can check Our audio editing guide. If you want to have wonderful effects on you video, you can apply different filters, overlays, and transitions. There are more than 300 video effects built in Filmora9, and there are many more in Filmora9 Effect Store. Afterwards, you just need to save it by clicking on the Export button and choosing the location where you want it to be saved. You can save your video in a variety of formats - but also share it directly on YouTube, Vimeo and other popular mediums. This definitely saves you time and efforts and integrates all the processes in a simple one. With Wondershare Filmora9, you can also add eye-catching filters, elements, transitions and text fields on your videos. You can definitely not only enhance the quality of your video, but also make it worthwhile watching. Wondershare Filmora9 lets you enjoy some of the most advanced editing tools. The program is packed with features and able to transform your video in a great way. 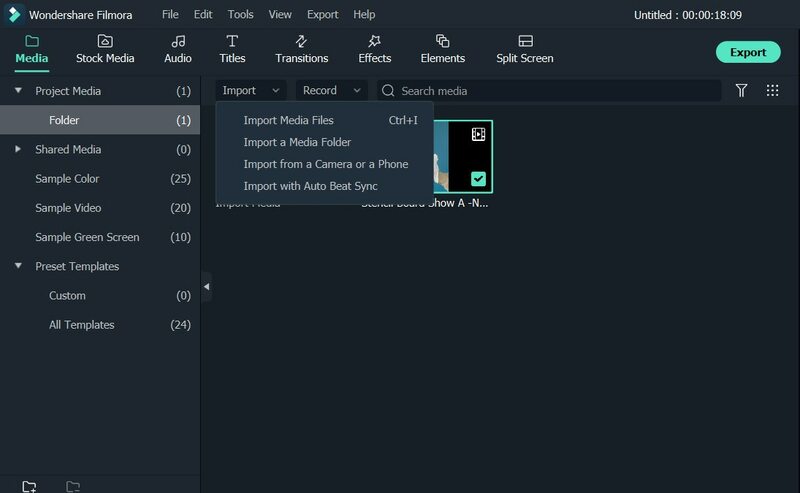 With tools like rotation, cropping and cutting, Wondershare Filmora9 can also let you use filters for your videos or add transitions and intros in them. We know that the standard Movie Maker by Windows has been our go-to app for filming videos. The new version of the Movie Maker is even better and lets you not only enhance, but also come up with new video and directly publish it on YouTube. Simply put, the Windows Movie Maker lets you import your video and edit it in an easy way. There is also a variety of effects and transitions which can help you switch through scenes. Also, you can add animated titles with texts and make your videos even catchier. Without a doubt, the Windows Movie Maker is one of the standard best quality video enhancers on the market. Instead of spending hundreds of dollars on professional video editing software, Mac owners can simply try editing their videos in iMovie. The best part is that the software can be used on iPhones and iPads, as well as on Apple's computers, so you can edit your footage immediately after you capture it. iMovie offers support for 4K videos, and it makes the editing process fun and easy. You just have to arrange your clips on the timeline, select the background music, create opening titles and end credits or add some cool visual effects and you're ready to share your videos with the public. iMovie lets you share your 4k videos to YouTube, Facebook or Vimeo directly from the Export menu, so you don't have to waste time waiting for your videos to be rendered and then uploaded to your social media account. Avidemux is a free open-source video editing program, which features a clear interface, so enhancing video quality is ease with Avidemux. The best thing about Avidemux when it comes to the top video quality enhancers is that it supports a lot of file formats. From FLV to MKV, AVI, WMV, MOV, OGM, MPEG and MP4, Avidemux lets you enhance the quality of any file format easy. The multithreading option is also a great feature - and possibly the program's finest advantage. However, there is no timeline nor creative effects or transitions to enhance the video. The Pinnacle studio is one of the video quality enhancers that uses fine stability, speed and responsiveness when enhancing the quality of your video. It is a neat and handy program that lets you explore the thousands of transitions, effects and options when increasing the quality of your video. Also, Pinnacle Studio can be downloaded in a version tailored to your needs. Yes, the program has many versions and you can choose a suitable one to use, but it doesn't have a Mac version. The software is simple enough that even someone with no previous video editing experience can quickly learn how to use it and yet powerful enough to enable you to produce 360-degree videos, stop-motion animations or just regular 4K action cam videos. VideoStudio also lets you resize or crop your clips, while the split screen feature enables you to combine several videos into one. 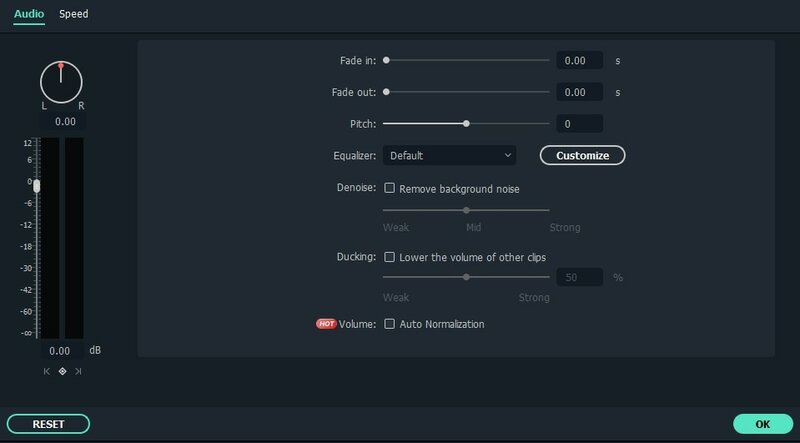 The library of over 1500 visual effects offers a sea of creative possibilities, while the Lens Correction tools the software provides can be used to improve the footage you're editing. The limited amount of timeline tracks and underwhelming audio editing features make Corel VideoStudio an unlikely choice for professionals, but if you are just looking to edit your footage quickly there are very few better options. Quentin Tarantino, Martin Scorsese or Danny Boyle are just a few world-famous movie directors whose movies were edited in Lightworks. What's more, in 2017 the software won the Emmy Award for pioneering digital non-linear editing. For nearly thirty years, Lightworks has been one of the best video enhancers in the industry, that offers groundbreaking features cinema professionals adore. This video editing software lets you do virtually anything if you know how. Multicam editing, rich selection of effects or support for a wide array of video file formats make Lightworks an excellent choice for skilled video editing professionals. Despite the fact that the free version of the software is available, buying a monthly or the annual license is still a much better option if you want to approach your next project professionally. The possibilities Final Cut Pro offers are nearly endless. 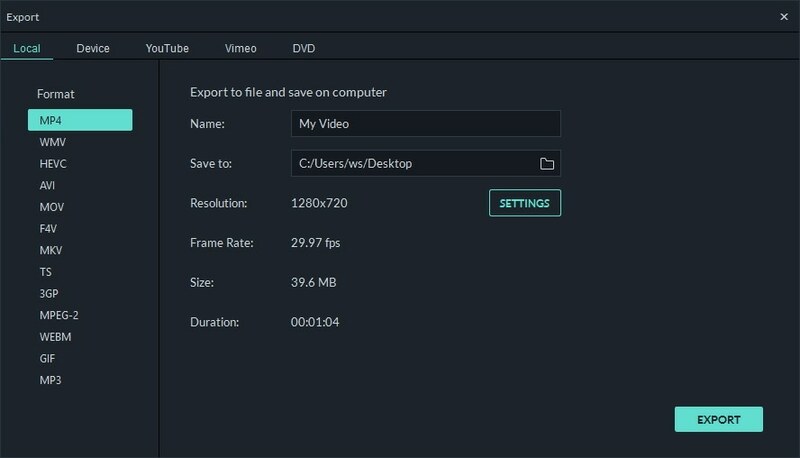 The software supports almost all video file formats, its non-linear timeline lets you arrange all sorts of media files freely, and the color wheels allow you to enhance the colors in your videos by simply dragging the mouse cursor. Besides providing support for 360-degree videos, Final Cut Pro also offers 360-degree graphics and effects. The video editor is built on a 64-bit architecture, which enables its users to work on highly demanding projects, although it is best to check the system requirements before installing it on your Mac computer. Final Cut Pro is ill-suited for newcomers to the world of video editing because using most of its features requires an enviable amount of skill. Although Vegas Pro has never been as nearly as popular as Premier Pro, the video editing options it offers are no less powerful than those provided by the Adobe's famed video enhancer. Vegas Pro software is equipped with tools that make the video editing process faster while maintaining a high quality of the processed footage. The latest version of Vegas Pro also features Picture-in-Picture and Crop OFX plug-ins that let you overlay or experiment with several images in a single frame. The Blue FX's Filter 5 Ultimate package contains 26 effects that enable you to manipulate colors in your videos or change the light, so each video you produce with Vegas Pro can have the visual style you want. Over the course of the last couple of decades, the Adobe brand has become synonymous with image editing. The company's software for editing still and moving images is considered to be among the best if not the best by most contemporary photographers, designers and movie makers. Premiere Pro CC enables you to turn the raw footage captured by any camera in any format into awe-inspiring videos. Besides offering superb video editing options that include powerful color correction tools and amazing effects, the software also offers a decent amount of audio editing options. The only downside is, that Premiere Pro CC is not best suited for inexperienced video editors and it takes quite some time to master all of its features. Choosing a video editing software that best serves your needs is never an easy task because there are so many different options available on the market. However, if you are not ready to really start working on your video editing skills, there's no reason to spend a lot of money on software like Final Cut Pro, Adobe Premiere Pro or Lightworks. 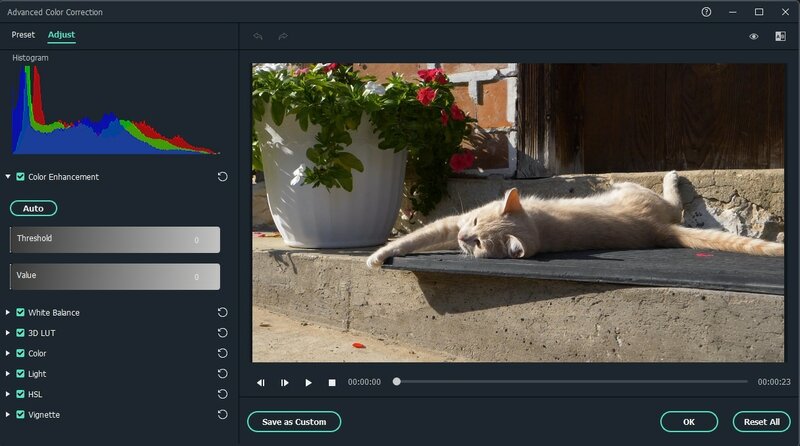 You can use the free video editor like iMovie or Windows Movie Maker, but you get what you pay for, and you won't have to spend a lot of money on Filmora9, but you'll still be able to produce impressive videos. Videographers and video editors who take the movie-making process more seriously can only benefit from using high-end video editing software products because they open up endless creative possibilities. Leave a comment below and let us know which video editing software you're using to enhance your videos.